Is your kitchen looking drab and outdated? 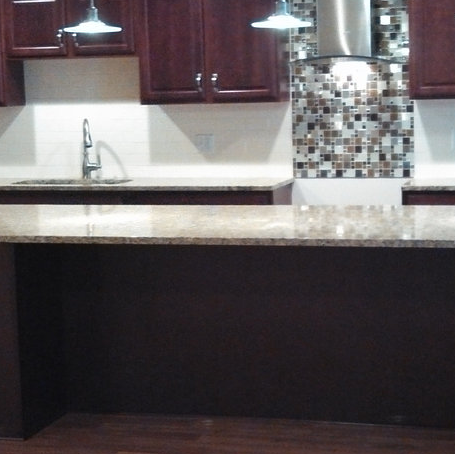 Transform your cooking surfaces with gleaming granite countertops from New Leaf Remodeling. This expert kitchen remodeling company based out of Rockford, IL, delivers a wide range of home improvement installations, from cabinets and exterior siding to flooring and doors. However, the most rewarding addition to your kitchen remodeling involves the surface you come in contact with the most. Choosing granite for your new countertops allows your kitchen to reach its full potential in terms of both style and function. Not only does granite look richer and more distinguished than conventional countertops; its strong and patterned nature makes it easy to clean off big messes and camouflage small ones as well. To find the perfect granite type for your kitchen, you’ll first want to consider the color palette and style of your floors, cabinets, and appliances. Picking a color of granite will be a lot simpler once you can narrow down options based on the rest of your kitchen. Popular configurations include granite countertops that directly match your kitchen cabinets or contrasting granite with veining that matches your cabinets. For a unique look in a large kitchen, you might even choose to have one color of granite for your perimeter countertops while choosing a contrasting color for your island. With hues ranging from gray and white to deep green and black, you’ll find a look to suit just about any kitchen. To truly understand the potential results of your kitchen remodeling plans, New Leaf Remodeling has designers on staff who will provide a number of visual representations—drawings, samples, and 3D CAD models—so you can see your finished kitchen before work has even begun. These expert remodeling contractors also offer online videos so you can garner inspiration for your project or simply gain a better understanding of how New Leaf Remodeling completes their work. Call them at (815) 904-6006 to discuss your new kitchen design plans, or visit the website to learn more about their trusted home improvement services.